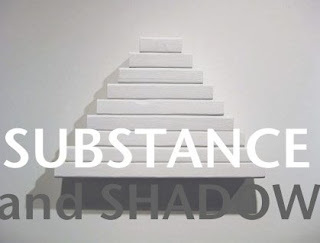 Substance and Shadow is a two-part collaborative installation between Chicago artists Chelsea Culp and Ben Foch. The title of the installation is derived from the novel Substance and Shadow, written by Marius Roux in 1879. The novel, which until recently has existed in obscurity, is a thinly shrouded expose of the early career of Paul Cézanne. Roux's title refers to La Fontaine's fable about the dog that drops the food in its jaw in an attempt to seize its more enticing reflection. This two-part installation attempts to unravel the dynamic contained both within and surrounding the novel and is an investigation into the social politics of early modernism, tackling both narrative and perception, its impact and its potential role in the contemporary. The garage will be used to address substance by creating an authoritative gallery space, a simulacrum for the experience of canonical art. Using drywall and lighting to produce this effect, the space will suggest a dumb experience of materiality. On display in the basement will be a collection of Peruvian burial dolls, religious relics that may or may not generate something insubstantial and formless, suggesting a conscious experience of immateriality. The substance and shadow of authenticity are separated to determine how much of one lay in the other, how many ways there are to act in accordance with either, and what conditions trigger the decisions to do so. **Bunker Brew and Vega icecream! Please excuse me if this is an inappropriate place to inform you about this show. Many thanks.